The title "God's Little Acre" comes from a book written by Erskin Calwell when writing about this area....the area from Augusta, Ga. to Aiken SC. It seems, that in his opinion, the farmers of the valley would assign a certain acre in which the profit from the sale of the produce on that acre would be given back to GOD. In his opinion of the valley people, he said if God's acre produced the most food the farmer would use that acre for himself and assign GOD the acre that wasn't producing, thus getting the title of "God's Little Acre". I wasn't living (if so I don't remember) when Erskin wrote the book so I can't say what is true and what isn't. Speaking of Mom, I love to hear her tell about her school years in Johnston (somewhere around Mt Calvery Church). She did not know which grade she completed because the school was just one room for all classes. She sat in on all levels of learning thus not knowing which grade she completed. Just this morning Mom told me about a "battle stick". They used the battle stick to beat the clothes to get the mud off the clothes. She said they would lay the men's clothes on a board and beat them with the battle stick, getting all the mud off before going to the wash tub of boiling water. 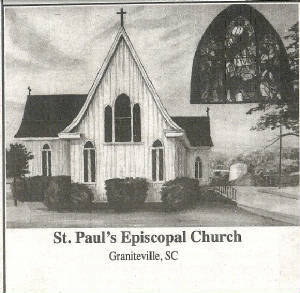 When her Mom and Dad separated she came to live with her Mom, Annie Pearl Hatcher in Madison, SC, which was between Warrenville, SC and Graniteville, SC....(the upper part of Horse Creek Valley) AKA God's Little Acre. Mom said Dr. Howell was the doctor in the area and would make house calls back then. Mom went to work at Graniteville Mill at age 14 b/c there were no child labor laws back then. That is where she met our Daddy and married. 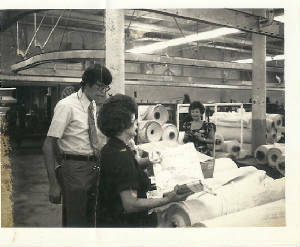 In later years after marrying Dad she moved to Clearwater, SC and went to work in Seminole Mill. Dad left us when the baby sibling was six weeks old so all of this history is about Mom raising us kids alone....no welfare or child support. 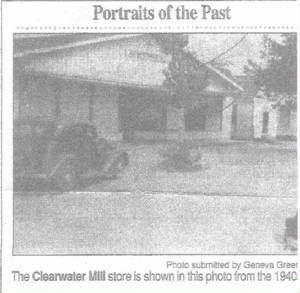 My memories of are of a small mill village named Clearwater, SC. The mills were owned by United Merchants & Mfg out of NY and Teneck, NJ. They owned the houses, the company store and pretty much owned the people. The residents (including my Mom) had to work in the mill or else they could not live in the houses provided by UM&MFG in the village. Low and behold if you lost your job.... you had no where to live. UM&Mfg. furnished the custodian who was Jake Sanders. Dave Attaway was the Constable (I think that was his title). I remember some of the supervisors: Buck Redd, Billy Ray Randolph, Grady McGraw, Alton Taylor, Herman Parker, Mr. Gunnells, Danta Berini, Earl Carter, Brodus Carter, Jody Dimsdale, Henry Miller, Grady Cato, Pete Cato, Pat Carroll, Bill Garner...see the memory is already leaving me....just can't think of any more. 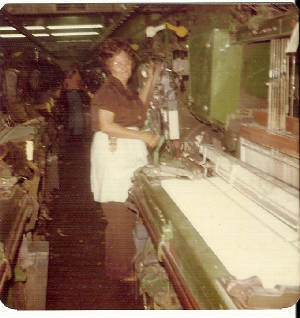 Mom worked in the Weave Room filling batteries at Seminole. There was no a/c in the plant where Mom worked. She got no breaks and ate her lunch (sandwich) as she went around the looms. I know all this to be true b/c I went to work there in HR dept in 1968. All that changed in later years though. I think the threat of a union changed that. There had been a union in previous years and the mill people almost starved to death so they were scared of a union. The company knew that and took advantage of the situation, however the younger folks coming in thought differently and voted in a union. The plant closed very shortly afterward. During the union drive, Martin Luther King III brought a bus load of people from Atlanta to march in protest. It was scary going through the marchers to get home. Reporters wanted interviews...it was wild. In my youth, Clearwater was a quiet village with honest hard working people. It was so safe we slept with the windows and doors open. We children were safe roaming the streets playing. I don't ever remember a murder but I'm sure there must have been one but I sure don't remember it. I remember the cemetaries had old graves caving in and we would go there at night with a flash light and you could actually see the skulls. We would be soooo scared. The graves were all grown up with underbrush and the roads were almost impassable. We had heard ghost stories about the ghost screaming so we would listen for screams and watch for ghost. Ghost stories were very common back then....yeah, we believed them. My Mom told me about the woman the train ran over and according to the old timers you could hear her screaming at midnight on the railroad track. Of course we had to check it out. I remember when I was very, very young, if a person died their body laid instate in the living room of the home. I don't remember too much about that but I do remember going to a couple of houses where the caskets were in the living room.....they were children (my little friends). I was told that before my time a horse and buggy would back up to the house and pull the wooden box to the cemetary but I don't remember that ....only what Mom told me. The family took turns sitting with the dead body all night and day. In Mom's day bodies were not embalmed thus creating all the ghost stories....and rightly so. Mostly what I remember is the lighting effect they used...it would be dim with the glo shining towards the ceiling....soooo scary. They would have a heavy velvet curtian behind the casket. To this day I hate velvet...reminds me of the decor used behind caskets. You won't believe how supersitious the old timers were. Mom would say that if a bird tried to get into the window it was a sign of a death. And when a person died a baby would be born shortly afterwards. Of course the black cat was one and Friday the 13th was another. I wish so much that I had written down all the sayings my Mom would say...such as "I am as slow as creme rising on buttermilk", and "driving like a bat out of hell". When saying "if" I had such and such Mom would always say " Yeah, and if a frog had wings he wouldn't bump his A@@." I just left Mom's house and she was reading the paper and said it had nothing but ads and that she is so poor she couldn't afford a tie for a piss ant. That cracked me up. Mom now says "once an adult and twice a child". She said the same blessing at meal time for all my life and now she can't remember what she said. It was something like "Father, we thank you for these blessings and all other blessings"....she said it so fast I never learned it. Her favorite saying was "What goes over the devil's back comes under." I also remember (I think I remember or maybe I heard so much about it, I think I remember) flour coming in bags and dresses being made with the floral flour bags. Before Junk Yard Jones died he would tell the story of being a cheerleader with me and tossing me into the air and the whole football field would be covered with flour from my flour sack drawers. hehe He was a cheerleader and so was I but not at the same time and of course the story was not true....anyway he always made me laugh telling that story. To this day I will not wear floral design dresses cus back in those days it indicated that you had on a home made flour sack dress. 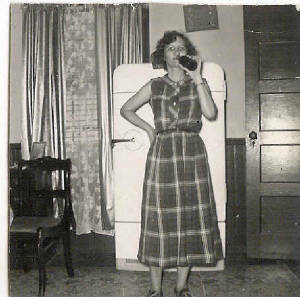 Home made dresses had a stigma. Floral design dresses still remind me of the flour sack dresses. While working at Seminole, Mom had to walk to work which was just a few blocks. I can remember Mom telling us about the dope wagon going through the textile plant. She stated that she couldn't get going till she had a coke every morning. Unbeknown to her the cokes back then had cocain in them. Below you will see pic of Mom drinking a coke....had to have coke to get going. The number #1 highway back then was two lanes and it was what is now hwy 421. I remember when they built the current highway #1 which runs through Augusta to Aiken. I remember the company store was owned or operated by Sam Monroe. You can see pic of the company store below. You can see a pic of the tiny post office at the right of the company store below where Mr Fatass was the post master. We couldn't afford a mail box so mail was sent general delivery and the post master would have to hand it to us. Well, there were five of us children so when five of us would go at different times Mr. Fatass would not be very nice to us....but you know what? I might not have been patient either. Alvie Sanders was the next post master and I think he probably hated to see us come too but never let us know it. Hardly any one had a college education back then. The supervisors came up through the ranks and if they didn't like you they would walk in the plant and fire you. There was no affirmative action or EEOC rules. Sexual harrassment was very common.... what was a female employee to do with children to support? We went to school at Clearwater Elementary. We walked through a slightly wooded area to get to school. I remember the names of several elementary teachers, Ms. Broadwater, Ms Rutland, and first grade teacher Ms. Kennedy. Back in those days the old timers really believed that "sparing the rod spoiled the child". Man, if they disciplened (sp) you now like they did back then...the DeHec (wrong initials) would have a bunch of kids to place in foster homes and a bunch of Moms and Dad in prison. Some people say the best thing to ever happen to the valley was the Nuclear plant coming to the area (the old timers call it the bomb plant). The Nuclear plant paid so much more than the mills. WOW, what a transformation to the valley. People of all walks of life were coming into the area. There were houses of ill repute, something I had never heard of. I remember they claimed there was one on CC Road and we slipped off and tried to see what they do there. Churches sprang up everywhere too . There were some more books written about the valley describing it as having tent revivals and houses of ill repute competing. The Valley boys had a bad reputation....they would never allow the Augusta and Aiken boys in the valley to date us valley girls. Some of them lived up to the bad reputation....some of the girls did too. This page is to be continued cus there is so much more to write about the valley: I hope I get it all down before my memory fails me completely.